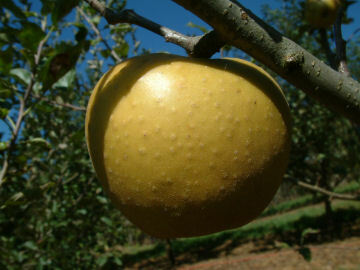 A fine flavored apple discovered as a limb mutation of Golden Delicious in the Browning Orchard near Wallingford, KY, by the late W. Armstrong, former Extension Specialist with the University of Kentucky. Introduced in 1970. Fruit is large, symmetrical round to somewhat conical and uniformly golden-brown. Flavor is rich and robust with a little more spiciness than Golden Delicious. Very productive. Ripens late September.